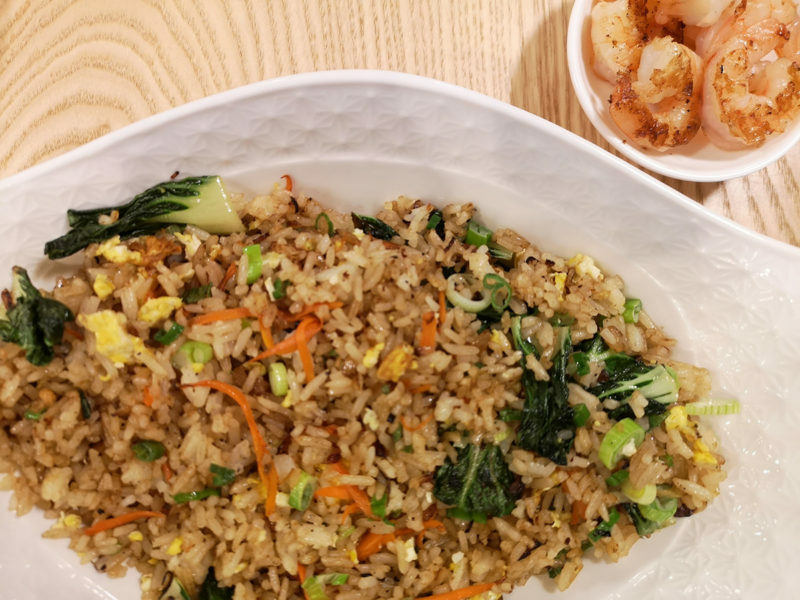 If you are looking for the proverbial cheap eats, here are ten suggestions, from fried rice and a sub to pork belly bao and vegan daikon fritters. Minced lamb with onions and parsley stuffs a pita (white or whole wheat) to which is added tomatoes, lettuce, onions, pickles and garlic mayo and hot sauce. Make sure you add pickled turnips—a classic topping of this food which draws on the owner’s family cooking and Syrian heritage. 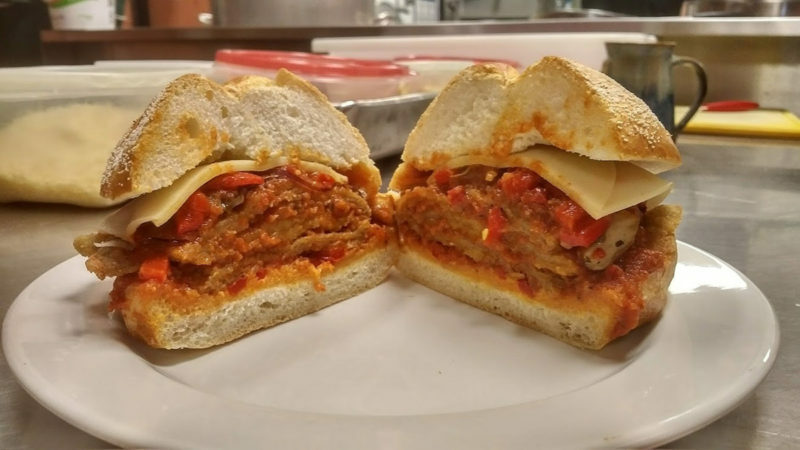 sandwich won gold last year as Ontario’s Best Veal Sandwich, a competition sponsored by the Veal Farmers of Ontario and held at Toronto’s St. Lawrence Market. Inside is braised pork belly in a five-spice sauce ratcheted up a notch or two with garlic mayonnaise and settled and cooled with cucumbers, pickled daikon, carrots and a bit of cilantro. The kitchen makes steamed bao buns by the dozens daily. It’s a fairly traditional dough that’s a little sweeter than a regular bread dough that is shaped into an oval, folded over on itself and steamed. 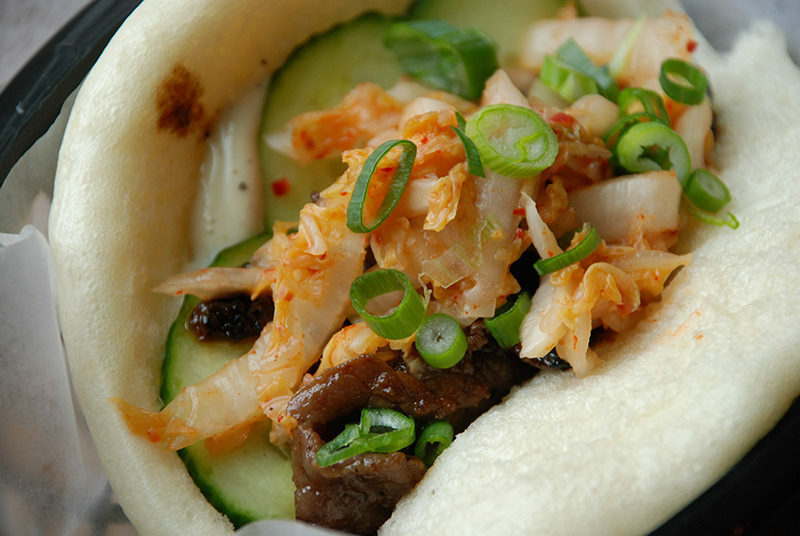 You can get banh mi and bao versions: both are under $10. This sub has assumed mythic proportions in Waterloo Region, not least as, to phrase it in a less colloquial manner, a snack one seeks out after one has spent a good portion of one’s evening in local public houses partaking of various liquid inebriants. But, any time of the day, the Munchie sub is meaty with Pepi’s sub sauce, lettuce, tomato and onion. The oven-toasting sends it over the top. A seemingly humble sandwich deceptively offers so much: baguette, toasty and crisp and packed with either pork, chicken or beef and supported by carrots, cucumber, cilantro and spicy mayo. 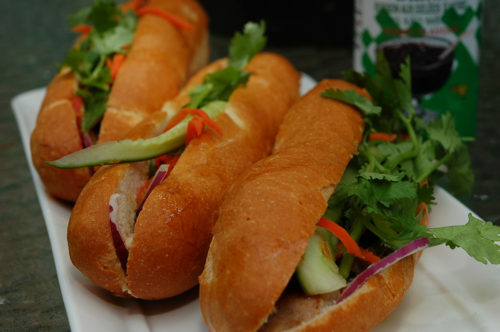 This inexpensive street food is a blend of Vietnamese and French cultures—and deliciousness for well under $10. Almost as famous as Harmony’s burgers are its breakfasts, offered Friday to Sunday from 8 a.m. to 2 p.m.. 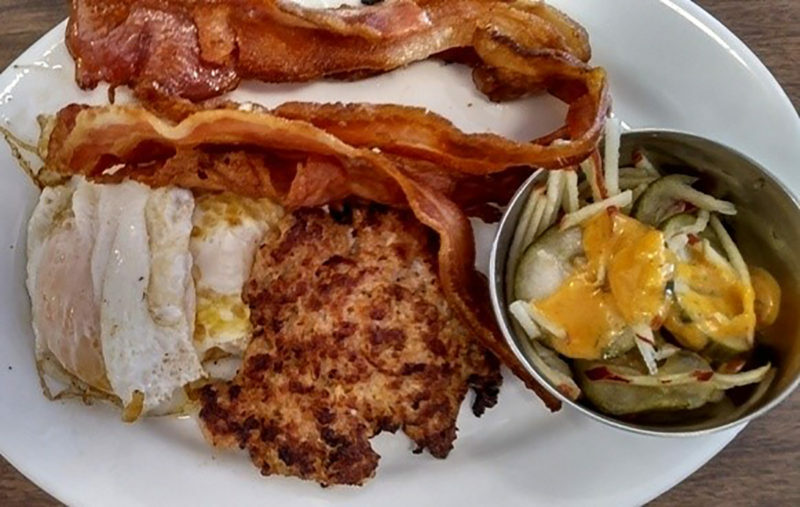 The wallet-friendly Lil’ Breakfast includes pork sausage patties, which set off the appetite perfectly and combine with eggs beautifully, and potato pancakes that are rich and creamy with a crisp exterior. But, the breakfast item that is perfectly placed is an apple-pickle salad that, imbued with a hit of vinegary acidity and some crunch, is a balance to the all richness and fat. I love that. Keepin’ it honest (and big) for the first meal of the day, Ethel’s breakfast bowl is home fries with scrambled eggs, bacon (or sausage) and Cheddar cheese. The inimitable Ethel’s has no deep-fryer but that never means compromising on the flavours in their bar and diner fare. The bowl is oven-baked and served with salsa and sour cream. There are ballpark franks and then there are baked hotdogs. At Crazy Canuck, located in Waterloo but adjacent to the St. Jacobs Market and in downtown Kitchener, the jumbo dog is nestled into a soft toasted garlic-butter baguette and baked with cheese, bacon and tomato with jalapeño mayo on the side. Then you get your choice of a side. Now, the price is over $10, but if you let them know that you saw this story, the dog is yours for $9.99. Lightly perfumy Jasmine rice, a staple in Thailand, is the starch component of a dish that then fries together eggs, carrots, onions, garlic, bok choy and an in-house seasoning sauce. It’s a good vegetarian selection, but you can add chicken, shrimp, beef as well as tofu—but that pops the price point over $10, of course.